Evette San's House is the home of Evette and Octieve San in Solitude. 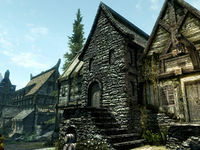 It is located beside Addvar's House, opposite the bottom door to Proudspire Manor. Upon entering there is a cupboard on your right holding an iron helmet and a couple of sacks. On your left against the northeast wall is a small set of shelves holding a horker tusk, a cave bear pelt, a red mountain flower, and a basket holding two bunches of lavender. To the right is a barrel and basket containing foodstuffs. On top of the barrel are six iron ingots. Against an interior half-height wall is a small wooden table and two chairs. On the table are two portions of grilled leeks, two seared slaughterfish, a loaf of bread, an eidar cheese wedge, and a garlic bulb. Over the table are racks holding four rabbits and three salmon. Past the interior wall, against the northwest wall, is a fireplace with a cooking pot in front and a cabbage in a cast iron pot on the hearth. Opposite against the southeast wall is a long table with various cheese, several loaves of bread, a couple of potatoes, a baked potato, a raw rabbit leg, a portion of grilled leeks, a salmon steak, a seared slaughterfish steak and a bottle of alto wine. Under the table is an open crate containing a sample of fly amanita, a gourd, a rock warbler egg and an orange dartwing. To the right is a second open crate containing vegetables. To the southwest is the rest of the house, including stairs up to the top floor. On the left is a bedroom with a single bed in the southern corner with an end table to the right and a couple of sacks at the end of the bed. Against the southeast wall is a wooden bench and against the northwest wall a small set of shelves holding a woodcutter's axe, two bottles of Nord mead, a bottle of wine, and a mead barrel. Back out in the corridor, to the left of the staircase to the rear of the house is a storage area with two cupboards. One holds two sweet rolls, a bottle of alto wine, an eidar cheese wedge, a sliced eidar cheese, a goat cheese wheel, four tomatoes, several loaves of bread, and a haunch of venison. The other holds a knapsack and an iron mace. Between them are several barrels of foodstuffs. There are also two sets of shelves under the stairs which hold various cheese wheels, cabbages, potatoes, a potion of regeneration, loaves of bread, two sheaves of wheat, a bunch of tundra cotton and a copy of Songs of the Return, Vol 19. Hanging from a rack beside a cupboard are three garlic braids. At the top of the stairs is a wooden bench. In the southern corner is a table holding a loaf of bread, with a cupboard to the left of this holding another knapsack and iron mace. Continuing along the southeast wall is another wooden bench and a stack of barrels all containing foodstuffs. Against the northwest wall is a single bed with an end table holding a bunch of tundra cotton to the left of it. Against a railing to the northeast are two unlocked chests. The house consists of six rooms. There is a fireplace and cooking pot on the right-hand wall, next to a cabinet with an iron helmet. On the left, there are two rooms. The first contains a table with food and chairs, as well as a shelf with ingredients, a horker tusk, and a cave bear pelt. There is a barrel with five iron ingots on top of it. In the second room, the kitchen, there is a lot more food, some of which lies on a long table. Next to this room is a bedroom with a bed, a bench, and a shelf with Nord mead and wine. 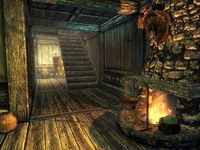 Behind the staircase is another room filled with food, barrels, a woodcutter's axe, an iron mace, and a knapsack. On a shelf, next to a few wheels of cheese is a potion of regeneration and a few ingredients. There are twelve wheels of cheese in this room alone. The upstairs is a simple layout, with a hallway leading to a bed. This hallway has a table and chairs, a cabinet with a knapsack, and another iron mace. Inside the cabinet, there are ten leather strips. At the end of the hallway are two chests. Next to the bed is one sample of tundra cotton. The key to the house is carried by Bendt, Evette and Octieve. Bendt, however, does not leave the Bards College at any time, has no dialogue about the Sans, or have any other possible reason for carrying the key. This page was last modified on 1 April 2017, at 23:55.